Marinate the steak up to 24 hours in advance of grilling to get a jumpstart on game day preparations. Add the mushrooms 2 to 4 hours before threading on wooden skewers. The creamy horseradish sauce clings well to the steak & mushrooms. Stir in an extra tablespoon or two of milk for a thinner sauce to drizzle over the kabobs. Place steak in a gallon-size zip-top plastic bag. Wipe mushrooms clean. Cut enough of the large mushrooms in half to equal 24 pieces. Add mushrooms to bag. Whisk together next 6 ingredients and 1 teaspoon salt in a small bowl. Reserve 1/4 cup marinade; pour remaining marinade over beef and mushrooms. Seal bag and chill 2 to 4 hours. Remove beef and mushrooms from marinade, discarding marinade; thread alternately on skewers and sprinkle with remaining 1/4 teaspoon salt. Grill over medium-high heat (350 to 400) for 3 to 4 minutes per side, brushing with remaining 1/4 cup reserved marinade after turning once. 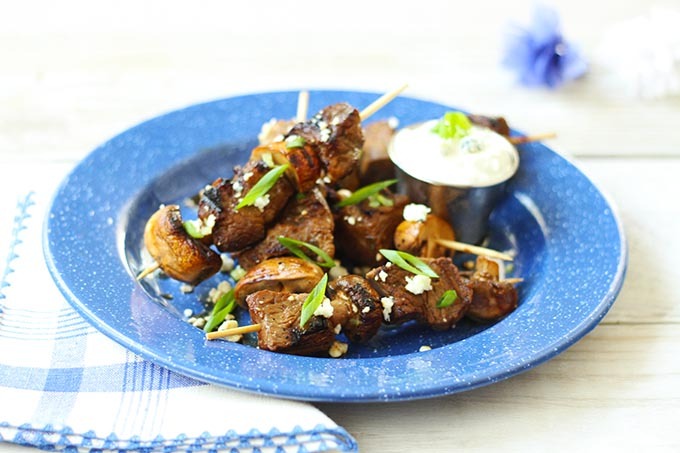 Prepare Big Blue Cheese-Horseradish Sauce and serve with kabobs. Garnish, if desired. Pulse all ingredients in a food processor until blended and smooth. Makes 1 1/3 cups.